None of this applies to men. Men have many more options than women when it comes to semi-professional-looking work shoes that are comfortable for standing and walking all day. But as a trainer, I do get asked often what shoes I recommend for standing on my feet all day. So here's a list of shoes I pack that are still available for purchase in the same or newer version. Also worth noting that I always wear one pair to the training venue (usually the more casual pair) and carry another (dressier), and I try to switch them every two hours. Looks decent with a pantsuit. Has some lift in the heel -- even an inch helps shorties like me. Comfortable enough to walk and stand in for a half day at a time. Breathe so they don't make my feet stinky. I LOVE these shoes. They are the tallest shoes in my closet that qualify as training shoes at 2.67" high. But they feel stylish, professional, and most importantly, comfortable. I like that they look equally good with pants or skirts. I get lots and lots of compliments on my Chie Miharas. I did buy them a couple of years ago, so I don't know if they are still available for purchase. I sort of found this pic on the Chie Mihara Web site but I say sort of because I think it's an archived pic, not among currently stocked shoes. 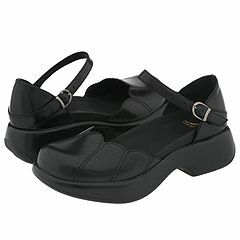 They are so beautifully crafted that I wouldn't hesitate to buy another pair from PedShoes.com... except for the price tag. That makes me hesitate. Also worth noting that they are Spanish shoes, so they are Euro sized... no equivalent to my U.S. 5.5 feet. I really need to wear socks or thick tights for my foot to completely fill the shoe. These get more compliments from the moms at my son's preschool than people I meet in training, but they have a 1" heel and the perfect comfort insole. Arch support is decent. I recently sensed the stink factor coming into play. I may need to investigate inserts that cushion and fight the stinkies, because these are comfy and unique. You can buy them from Merrell for $90, but I bought mine through an Ebay retailer for $60. My Danskos are the previous version of this Lotus shoe. Mine have an open heel, and I think my ankle straps are a little wider. Plus, mine don't have the cute "petal" detailing. But let's be honest: either version of these shoes is clunky. If they weren't so darn comfortable I may have ditched them by now. I bought them two summers ago for a long trip to Europe, with lots and lots of walking, and they were just amazing. They are great for all-day comfort, but I am self-conscious about how they look, and they make a funny squidgy-sticky sound when I don't wear socks with them. I think I may try these Dansko Desiree shoes from Nordstrom if I am so inclined to go the Dansko route again. Smaller, less obvious all around. These shoes are a dream. Definitely not dressy, and I only wear them with a full black pantsuit. It's the only way I don't look like I'm out running errands. I wish they came in ALL BLACK. The nubby insoles are so, so wonderful, and the toe box is wide enough to not pinch toes even after a full day. Unlike many modern shoes, it comes in half sizes, so I was able to buy a size 5.5, not a 6 that would need me to wear thicker socks for a great fit.